(From left to right) Indium Corporation Director of Marketing Communications Rick Short, City of Rome Director of Economic Development Jake DiBari, City of Utica Mayor Robert M. Palmieri, and Indium Corporation President and CEO Greg Evans. CLINTON, N.Y. – Several local and state officials recognized Indium Corporation Thursday, March 13, for the company’s 80 years of achievement. The day was also proclaimed Indium Corporation Day in Oneida County, and in the cities of Rome and Utica. 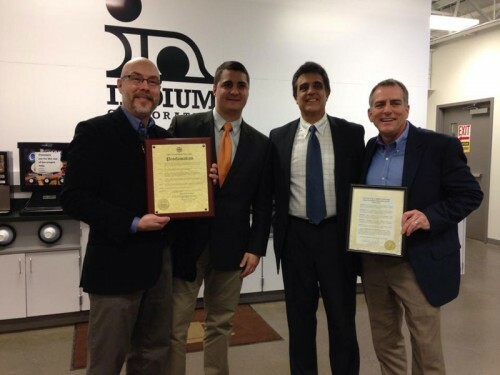 Palmieri and City of Rome Director of Economic Development Jake DiBari, on behalf of Rome Mayor Joseph Fusco, presented proclamations to Indium Corporation employees at a luncheon celebration at the company’s Business Park Drive facility. “As a previous employee of Indium Corporation, I’m honored to celebrate its 80th anniversary with you all today and look forward to the next 80 years,” DiBari said. Proclamations and certificates of recognition were also shared on behalf of Kirkland Town Supervisor Robert J. Meelan, Oneida County Executive Anthony J. Picente Jr., State Assemblyman Anthony Brindisi, State Senator Joseph Griffo, U.S. Representative Richard Hanna, and U.S. Senator Charles Schumer.